Do you know the answers to our top Legal Hotline questions? 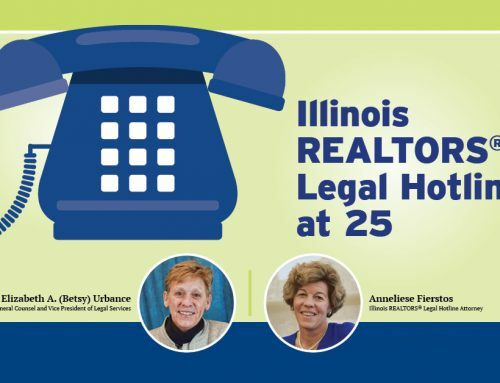 IAR gets calls all the time on its Legal Hotline asking for guidance on real estate issues. We asked Legal Hotline attorney Betsy Urbance to share with us the top questions and answers from the third quarter. Test your real estate knowledge below. Q. Is it legal for me to pay referral fees to unlicensed individuals for ­referring real estate sellers or buyers to me? A. No. Generally speaking, you cannot pay anything of value to an unlicensed ­person in exchange for referring real estate brokerage business to you. If you are licensed, the Illinois Real Estate License Act (the Act) applies to you. Section 10-15(a) says “no compensation may be paid to any unlicensed person in ­exchange for the ­person performing ­licensed activities in ­violation of this Act.” Section 1-10 of the Act, under the definition of ­Broker, says a person who assists in “procuring or referring of leads or prospects, intended to result in the sale, exchange, lease or rental of real ­estate” for another and for compensation, needs a real estate license. Finally, ­Section 20-20(a) (38) says licensees who pay compensation in violation of ­Section 10-15 will be subject to discipline. The bottom line is real estate licensees may not pay unlicensed people (who are not party to the transactions) anything of value in exchange for a real estate referral. If you do, you can get in trouble. Also, keep in mind that compensation can be anything of value, from cash to ­televisions to baseball tickets. Q. How should I handle multiple offer presentations, and how can I be sure my offer is presented if I am the buyer’s agent? A. The License Act and the Code of Ethics require licensees to present all offers as soon as practicable, unless sellers waive the right to see them. Above all, the bottom line for the listing agent is to keep the seller client informed and follow the seller’s lawful direction. Offers must be presented in a manner that are in the seller-clients’ best interest. But agents aren’t legally required to share offers with seller-clients in the same order they’re received. If possible, listing agents should present all offers at the same time. Agents aren’t legally required to disclose to all other buyers that there are other offers. Agents should consult with seller clients about offers on the table and check their office policies. The REALTOR® Code of Ethics, Standard of Practice 1-15, requires REALTORS® to divulge the existence of offers on the property as long as the seller clients approve. After considering all terms of each offer, it is the seller’s decision to reject, counter or accept. Q. What can be done in situations where listing agents have bank-owned properties (lenders get properties back through foreclosure) and listing agents are non-responsive to buyer clients’ offers? May I go around the listing agents and work directly with the sellers? A. No, it is not legal for you to “go around” listing agents and work directly with sellers. The Illinois Real Estate License Act (the Act) requires licensees to deal through exclusive listing agents. So you may not go directly to sellers without consent from listing agents. On the other hand, the Act does not apply to unlicensed buyers who can go directly to sellers to make sure their offers have been received. We typically do not know how sellers are directing listing agents to proceed with offers that come in. Listing agents have a duty to present all offers to the sellers until closing, unless seller clients are directed otherwise. If listing agents seem unresponsive, you can contact managing brokers for status reports on your buyers’ offers. Or you could ask for something in writing signed by the sellers. However, keep in mind that sellers of foreclosed properties might not be willing to sign anything to prove offers are received or considered. I encourage listing agents to communicate with buyers’ agents to at least describe the procedures listing agents are following in presenting offers to the seller clients. If you have proof that listing agents are stonewalling, you should file a ­complaint at the Illinois Department of Financial and Professional Regulation’s Division of Real Estate (DRE). When listing agents are REALTORS®, you can also file ethics complaints with local associations. Use the processes in place to encourage others to follow the rules and comply with the Act. Q. Was there a recent change made to the Illinois Residential Real Property Disclosure Act? A. Yes. Effective Jan. 1, 2015, PA-98-0754 adds the words “windows” and “doors” to question #6 on the Illinois Residential Real Property Disclosure Form. These changes are the result of a case where the court held that leaking windows and doors were not included in the definition of walls, and thus the seller had no obligation to disclose defective conditions involving windows and doors. PA 98-0754 fixes this issue.